GilSing's 'Wind Images' are unique works and produced as single pieces. Individual requests can be incorporated into the design upon agreement. The motifs are digitally printed on Polyweb to ensure long durability, cut on three sides with Eurolaser and can be produced in sizes ranging from 100 cm x 300 cm up to a maximum of 150 cm x 600 cm. Prices depend on the size and range between €1,800 and € 2,200 including production costs. Costs for multiple or repeat orders of the same motif: € 600 to € 800. All prices are exclusive of VAT (if applicable) and shipping costs. The wooden 'Shadow Thieves' as presented on the images are for sale. GilSing also designs these figures upoon individual request. They are manufactured in wood for interior use or in metal for outdoor use. All prices are exclusive of VAT (if applicable) and shipping costs. Gilsing' s' Firebirds' are permanent metal installations made to order. The delivery time is approximately 6-8 weeks. Orders can be made as of May 2018 - price upon request. 23 km south of Marrakech, Viennese artist André Heller transformed a section in the desert inspired by Villa Hruska on Lake Garda, into a second botanic garden of paradise. Monika GILSING created twenty ‘wind pictures’ – artistic, colourful textile pictures, dancing happily in the Atlas Mountain landscape. 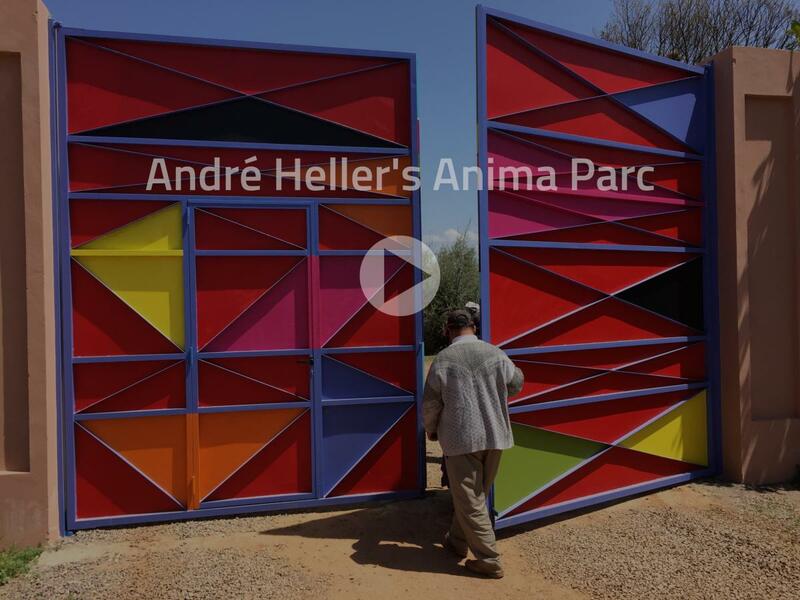 Anima Park spans eleven hectares and is open to the public. André Heller comments on her work; “Monika GilSing is nearly always busy with figures that are in the midst of strong experiences. I suppose that her observations do not derive from a dream world but rather from the real planet of the ones obsessed by drawing and images. Great talent and mastery is needed in order to reach there… “. Monika GilSing was born in Hamburg. Art and graphic art studies in Hamburg. For over twenty years, she worked as a graphic artist, illustrator, caricaturist and creative director in Zurich, Hamburg, Vienna and Düsseldorf. After turning her back on professional agency work, GilSing returned to her visual passion. The key artistic points of her work lie in painting and object art. Ideas for her works originated on her study trips to Africa and Asia. The borders between applied art and free expression have become fluxionary in her works. The creative passion, developing picture dreams for André Heller (LINA LUNA in Hamburg or in Udaipur / India) or three-dimensional steel and wooden sculptures, for example, placed in the landscape in Bad Blumau / Austria give her just as much pleasure as creating a new watch collection for Swatch. Monika GilSing creates her works from the centre of the moment, the "immediate". Worlds, in which the observer can mirror her/himself. She herself describes her work as, "I am just a spot and line". The act of discovery finishes when something has been created with which one can enter into a dialogue. GilSing shows us a figured-abstract extract that, however, is not a realistic extract. Through her perception, pictures appear in a depth and sharpness, in a breadth and height, which enables the observer to experience encounters with himself. GilSing is a masterful technician who intriguingly, and yet with humour, varies the theme of the world of pictures in changes from cold and warm colour tones, from suspense to serenity, from the dramatic to stillness. In her figured-abstract works, which are accompanied by lyrical titles, the pictured topic remains as a structural element – sliding into the non-committal never takes place. Magically expressive figures enliven the canvas or the piece of paper with their colourfulness. The autobiographical aspect of GilSing’s works as well as the pluralism of her interests, is always present. The symbiosis of rationality and irrationality, logic and fantasy, create an empathetic work. Her puzzling picture ciphers give food for thought for a long time.